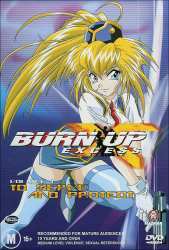 Containing 4 episodes, Burn Up Excess is a delight to watch and a great addition to any anime fans DVD collection. Whilst not breaking any boundaries when it comes to animation style or story content, the disc will provide good entertainment aimed at the adult/later teen audience. Team Warrior is the name of our collective bunch of heroines that go into action when action demands only the best. The team is comprised of the gold digging Rio, machine gun toter Maya, Lilica, computer nerd Nanvel, Yuji and the head of the operation Maki. The disc in it's entirety serves up some very delicious action and great humour. I did find the voice acting to be a little bit lacking at times, however if this gets on your nerves too much, be a purist and play it in Japanese with English subtitles. There are a bevy of features for this disc, not the least of which is the 'Jiggle Counter'. This feature is probably only best suited for the male viewer (and a few ladies as well) as it features a counter that starts whenever a voluptuous lady's breasts move around on the screen. It's fairly tacky but I must confess that I found it to be funny. The disc also contains some very interesting sketches of the artwork that comprised the show. I am an enthusiastic for knowing how things like this are developed so it was a nice touch and I believe added to the overall value of the DVD. All things said and done, the mix of great animation, engrossing storyline and all round presentation makes for one good DVD to add to your Madman collection of anime!